MOSCOW, Idaho – In its first year with the two-tiered letter of intent signing, and in its first recruiting cycle since returning to the Big Sky Conference, Idaho football addressed current needs on the offensive and defensive lines and a future need at linebacker. The Vandals added a notable amount of speed. The class has a presence in the Northwest with two recruits from Idaho, four from Washington and one from Oregon. “Our assistant coaches did a great job,” head coach Paul Petrino said of the 22 players Idaho signed in December and February. Petrino acknowledged Idaho probably missed out on several potential recruits who were committed to playing in the Football Bowl Subdivision instead of the Football Championship Subdivision the Vandals now inhabit. But the Vandals may have signed at least one player who would star at any level, Michael Maafu, a 6-foot-2, 266-pound defensive lineman from Saguaro High School in Phoenix. UI defensive line coach Luther Elliss said Maafu comes to the Vandals with a background in rugby. As such, he’s already schooled in the tackling technique of leading with a shoulder, wrapping up and rolling that is taught in rugby and is increasingly taught again in football. Idaho also expects immediate contributions from defensive linemen Aarron Boatright (6-5, 241), from East Mississippi College, and Cameron Townsend (6-1, 277), from Moorpark College in West Hills, California. Idaho’s greatest need was improving an offensive line that had to get stouter, regardless of whether the Vandals were still in FBS or are back in the Big Sky. Several junior college linemen signed this year are expected to play right away. Idaho took Bruce Burns (6-3, 330) and Brian Robinson (6-4, 330) from California’s Laney College. Those two blocked on a line that averaged 260 yards rushing per game. Petrino projects Burns as a guard. Robinson can play anywhere along the line. Edwin Cortez Grande (6-5, 291), from Monterey Peninsula College, will also compete for a starting role. Petrino would like to see him get bigger but is impressed with his athleticism. The Vandals also picked up Matthew Faupusa (6-3, 310), from Los Alamitos High School in Cypress, California, and Logan Floyd (6-4, 289), from Utah’s Kearns High School. With three steller seniors at linebacker next year in Kaden Elliss, Tony Lashley and Ed Hall, the Vandals recruited for the future when they signed Tre Walker (6-1, 226), from California’s Fresno Central High School; James Jones (6-1, 243), from George Washington Carver College Academy in New Orleans; and Coeur d’Alene High School’s Ross Chadderton (6-1, 210). Petrino watched Chadderton return an interception for a touchdown in a state semifinal. The Inland Empire League Defensive Player of the Year also forced seven fumbles as a senior. The Vandals also welcome Khalil Forehand, a 5-10, 175-pound running back from Boise’s Bishop Kelly High School. Forehand is a defending state champion in the sprints and may run track at Idaho in addition to playing football, Petrino said. Connor Whitney (6-3 200), from West Valley High School, will get an early look at tight end. Cheney’s Logan Kendall (6-4, 256) starred as a defensive lineman in high school. UI running backs coach Jason Shumaker expects senior Isaiah Saunders to have a breakout year. But Idaho lost last year’s Sun Belt Conference rushing champion Aaron Duckworth to graduation, and newcomers like Forehand, Kendall and Aundre Carter (5-9, 236), from Clay High School in Starke, Florida, have a chance to make an early impression. “We tell everybody to be ready to play right away,” Shumaker said. 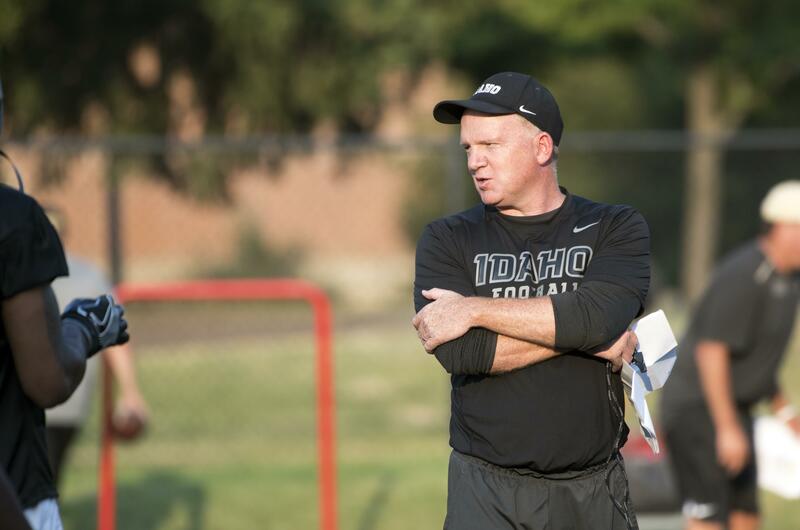 Defensive coordinator Mike Breske is looking for contributions from Idaho’s defensive recruits. “Find a way to get into the two deep, and we’ll go from there. Help on special teams, too,” Breske said. Petrino said the newest Vandals fit in well with an Idaho football culture of hard work and accountability. Noting their classroom achievements, Petrino called this year’s group of recruits his smartest. It’s a big statement for a school that boasts a first-team Academic All-America in recently graduated receiver Jacob Sannon. “We might have four in this class,” Petrino said. Published: Feb. 7, 2018, 6:26 p.m. Updated: Feb. 7, 2018, 6:47 p.m.